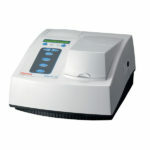 This type of lab equipment encompasses the separation, quantification, and identification of natural and synthetic materials. Instrumental analytical chemistry utilizes specific equipment to acquire physical measurements. Some of these measurements are florescence, conductivity, and absorption of light. Measures the interactions between forms of matter and electromagnetic radiation using Spectrometers, Spectrophotometers, Spectrographs, and Spectral Analyzers. Identifies the amount and type of each chemical present in a given sample material using Mass Spectrometers, Mass Analyzers, Ion Sources, and Detectors. Measures potential voltage and current possible in an electrochemical cell using Selective Indicator Electrodes, Glass-Membrane Electrodes, and Working/Auxiliary Electrodes. Measures the interaction of heat on a material using Bomb Calorimeters, and Differential Scanning Calorimeters. Used to decrease the complexity of mixtures uses Centrifuges, Distillers, Freezers, and many more. 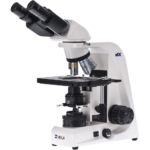 Provides real time views of single celled organisms and single cell functions using Microscopes, Electron Microscopes, Light Filtration, and Florescence.